In a prepared cookie sheet, place the boneless chicken breasts on the cookie sheet. Sprinkle with salt and pepper. Bake for about 30 minutes, or until the chicken is cooked through. 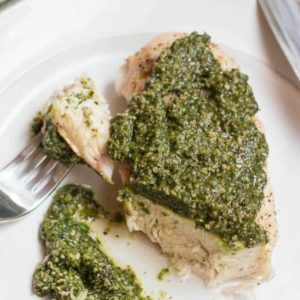 Remove the chicken from the pan and put 1/4 cup of pesto on each chicken breast. Serve immediately. I bought 1 lb chicken breasts, and the breasts, as you can see, were huge. I recommend slicing them in half if you can. I didn't eat half of my chicken breast because it was so big. The arugula garlic parmesan pesto recipe can be found here.